Note: The latest report is that at least 58 Palestinians were killed and more than 2,700 were injured, including 1,350 by gunfire. The protests spread to the West Bank, in opposition to the relocation of the U.S. Embassy. The Israeli army fired live ammunition, tear gas and firebombs at people assembled along several points near the fence with Israel. Also, at the Qalandiya checkpoint in the West Bank, Israeli soldiers fired tear gas and rubber bullets at Palestinian youth who were throwing stones, Al Jazeera reports. Israeli forces kill at least 52 Palestinians protesting in Gaza as US moves embassy to Jerusalem. 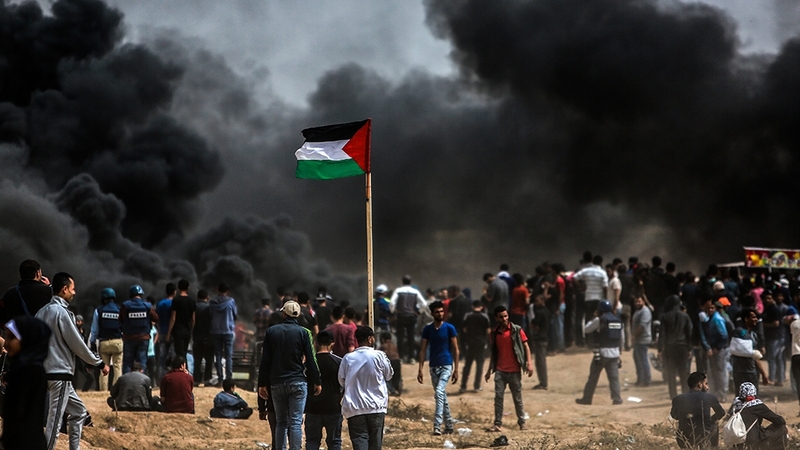 At least 52 Palestinians were killed on Monday in Gaza and more than 2400 others wounded as the Israeli army fired live ammunition, tear gas and firebombs at protesters assembled along several points near the fence with Israel. The demonstrations, which coincided with protests against the opening of the US embassy in Jerusalem, are part of a weeks-long protest calling for the right of return for Palestinian refugees to the areas they were forcibly expelled from in 1948. Since the protests began on March 30, Israeli forces have killed at least 90 Palestinians in the coastal enclave and wounded close to 10,500 people. 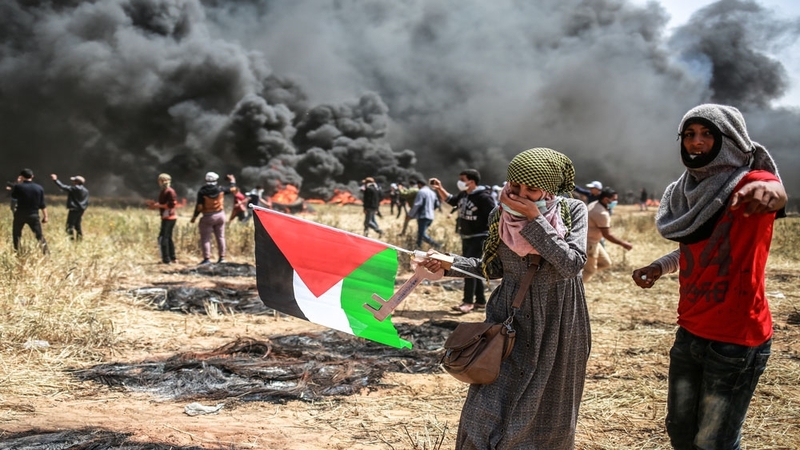 The protest comes ahead of the annual commemorations of the Nakba, or “catastrophe”, when the state of Israel was established on May 15, 1948, in a violent campaign that led to the expulsion of hundreds of thousands of Palestinians from their villages. Palestinian President Mohamed Abbas describes events in Gaza as “one of the most ferocious days” during a press conference on Monday. “On this day, the Israeli massacres against our people continue in the Gaza Strip as well as the West Bank. Today is one of the most ferocious days that our people have witnessed,” said Abbas. “We will use all of our available rights in the security council to see it shouldering its responsibility to condemn this massacre and bring those responsible to justice,” said Mansour. There has been an increasing need for blood as 52 Palestinians have been killed and 2400 others injued across Gaza so far. British Prime Minister Theresa May’s spokesman urged “calm and restraint” in the Gaza Strip on Monday after deadly clashes ahead of the opening of the US embassy in Jerusalem. The prime minister’s spokesman said: “We are concerned by the reports of violence and loss of life in Gaza. We urge calm and restraint to avoid actions destructive to peace efforts. The spokesman also reiterated Britain’s commitment to a two-state solution between the Israelis and Palestinians with Jerusalem as the shared capital. “The hospital smells like blood, there is blood everywhere,” local journalist Maram Humaid told Al Jazeera from the Indonesia Hospital in the northern Gaza Strip. “Those wounded are lying on the floor – there are no more beds to accomodate them. The hospitals are overflowing,” Humaid added. Jordan’s government spokesman, Mohammed al-Momani, condemned Israel’s use of “excessive force against the defenceless Palestinian people” and described the violence as a “crime”. Egypt meanwhile “expressed its strong condemnation for the targeting of unarmed Palestinian civilians by the Israeli occupation forces”, according to a foreign ministry statement. A leaflet circulated by the organisers reads: “The national committee for the Great March of Return invites you to participate in the peaceful popular protest, One Million of Return and Breaking the Siege”. Afanah’s death takes the number of Palestinians killed by Israeli forces since the protests began to at least 49. Israeli forces have shot dead a 40-year-old man, Jaber Salem Abu Mustafa, east of Khan Younis, according to Palestinian health officials. 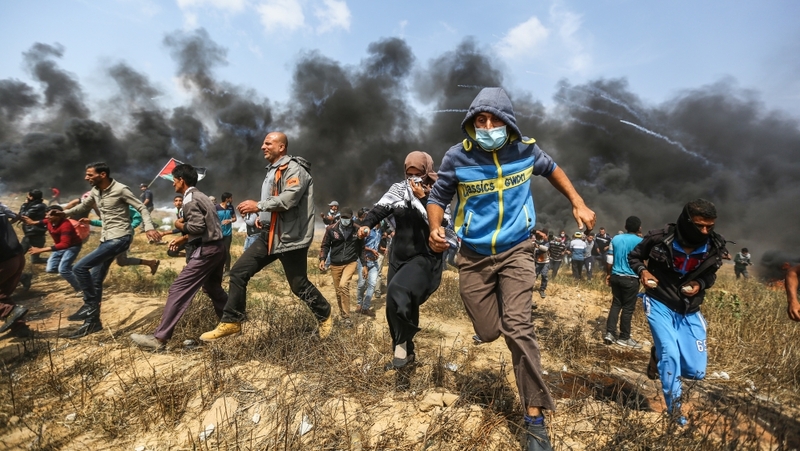 Ashraf al-Qidra, spokesperson for Gaza’s health ministry, said 167 other people had been wounded by live ammunition, tear gas, and rubber-coated steel bullets. One journalist was among those injured. He sustained an injury in his foot east of Khan Younis. Al-Qidra said medical staff are conducting therapeutic treatment for dozens wounded by Israeli forces, including women and children. 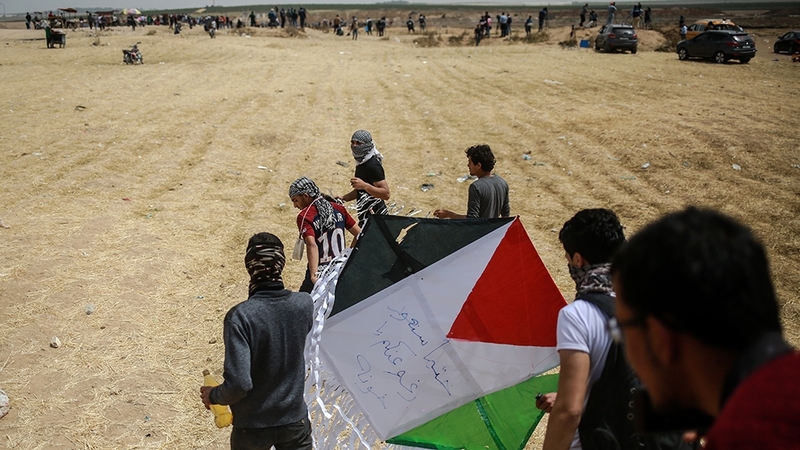 Al Jazeera’s Stefanie Dekker, reporting from the Gaza-Israel border, said young people have been arriving at the protests with tyres to be burned to reduce their visibility to Israeli forces positioned with snipers on the other side of the fence. “We’ve already seen one youth injured this morning, hit by live fire. He was very close to the fence, taken away in an ambulance,” Dekker said. “What people here will tell you is that there is a lot of pressure. It has resulted in a lot of pressure on Israel. Dekker explained that there might be fewer demonstrators attending this Friday’s protests compared with previous weeks because Palestinians are preparing for far bigger protests in the days to come. Around noon, some 50 Israelis began marching towards the Gaza border protesting against the Israeli blockade on the Gaza Strip and the Israeli army’s use of lethal force against unarmed Palestinian protesters. Al Jazeera’s Harry Fawcett, reporting from the Gaza-Israel border, said there were no reports of deaths and that the number of people injured on Friday marked “a substantial decrease” as compared to previous weeks. Azzam Oweida, a 15-year old boy, who was shot in the head by Israeli military on Friday has died of his wounds on Saturday. Three other Palestinians were shot dead during Friday’s peaceful protests. Four Palestinian demonstrators were killed and 955 injured by Israeli forces during the protests on Friday. The health ministry identified the three men and child as Khalil Atallah, 22, Muhammad Amin al-Muqid, 21, Abd al-Salam Eid Zuhdi Baker, 33, and Azzam Oweida, 15. 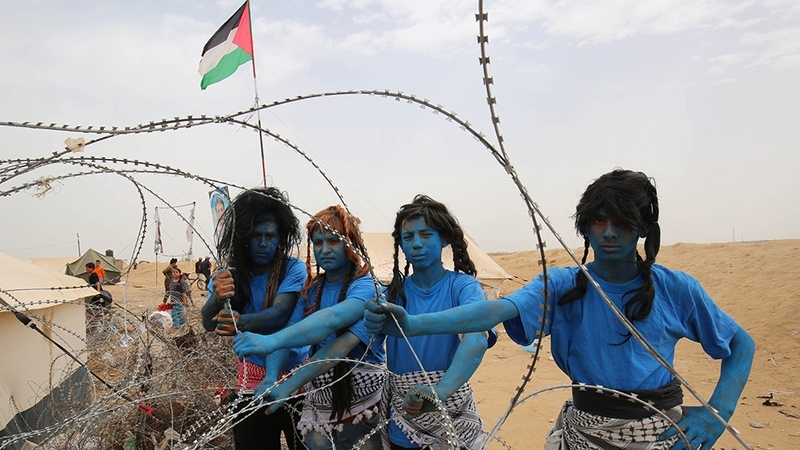 “Thousands of people stood right at the border, then we heard Israeli forces opening live fire. They’re still doing that sporadically as we speak,” Al Jazeera’s Stefanie Dekker reported from the Israel-Gaza border. Eighteen medical personnel and journalists were among the wounded. 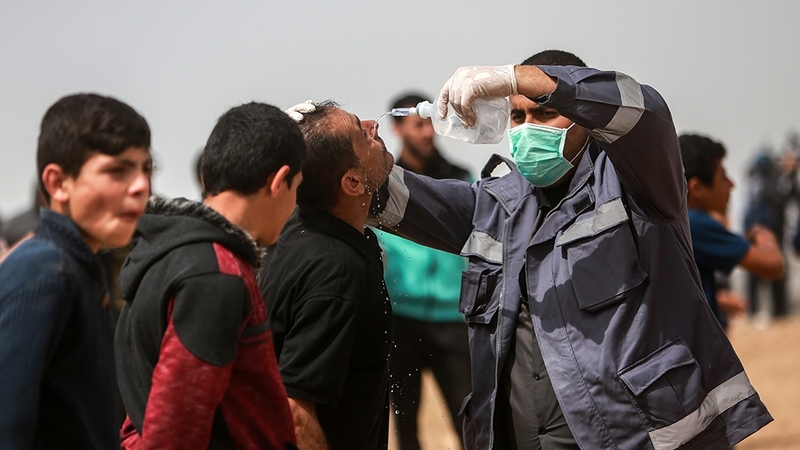 Ashraf al-Qidra, spokesperson for Gaza’s health ministry, said Israeli forces targeted medical service points twice with an unidentified gas east of the al-Bureij refugee camp in central Gaza. The Palestinian news agency WAFA reported that at least six Palestinians were injured when Israeli forces fired live ammunition at protesters, while the rest were hurt because of teargas inhalation. 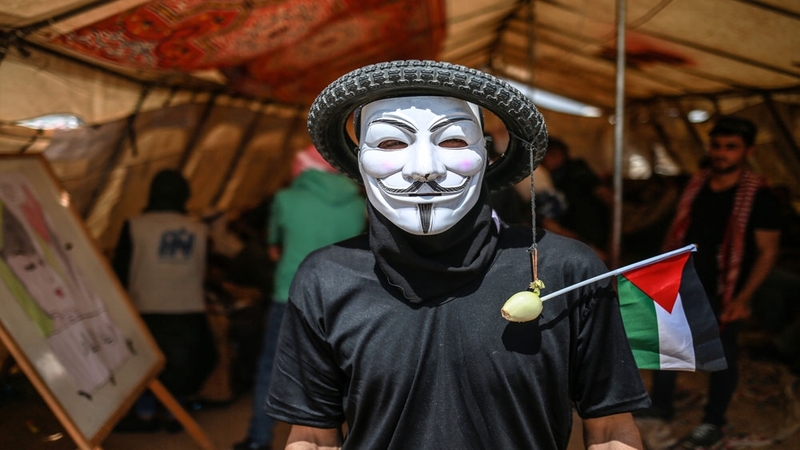 Hundreds of protesters have been gathering at the eastern and northern borders of the Gaza Strip on what they called the “Friday of Rebellious Youth”. 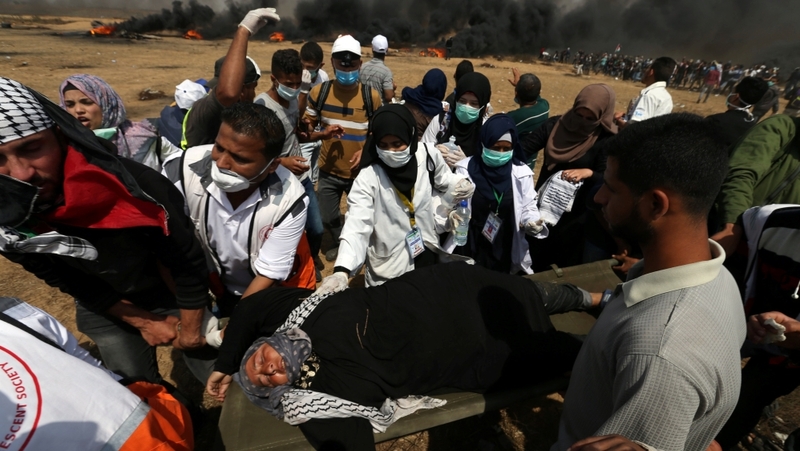 UN High Commissioner for Human Rights Zeid Ra’ad al-Hussein has condemned Israel’s use of “excessive force” against Palestinian protesters, saying its security forces must be held to account for the many deaths and injuries sustained by Palestinians in the past month. 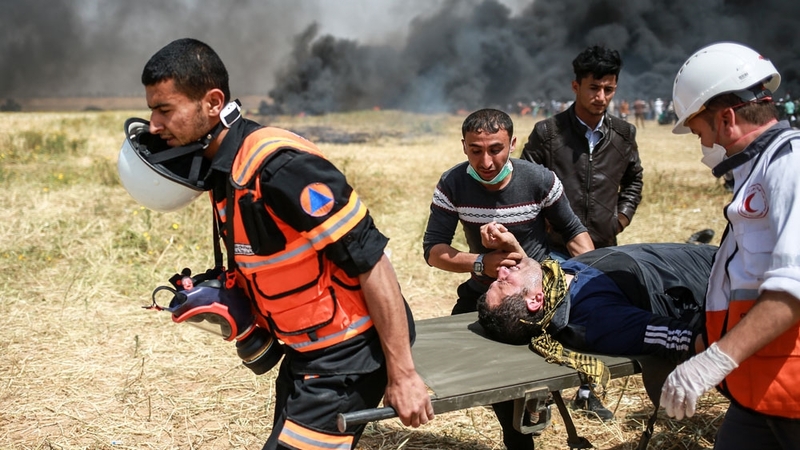 In the past four weeks, 42 Palestinians were killed and more than 5,500 injured along the fence in Gaza, with no reports of Israeli casualties. Ashraf al-Qidra, spokesperson for Gaza’s health ministry, added that at least 729 Palestinians, including 45 children, had been wounded by Israeli forces. Freed in a 2011 prisoner swap with Israel after more than 20 years in jail, Sinwar told the crowd of protesters that they would “march on Jerusalem”. 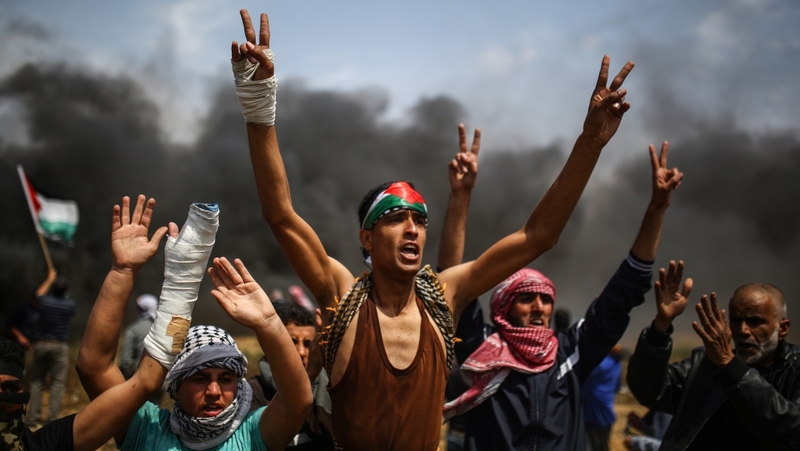 Asaad Abu Shariek, a spokesman for the Great March of Return protest movement, said demonstrators were following a path laid down by South Africa during its struggle against apartheid. 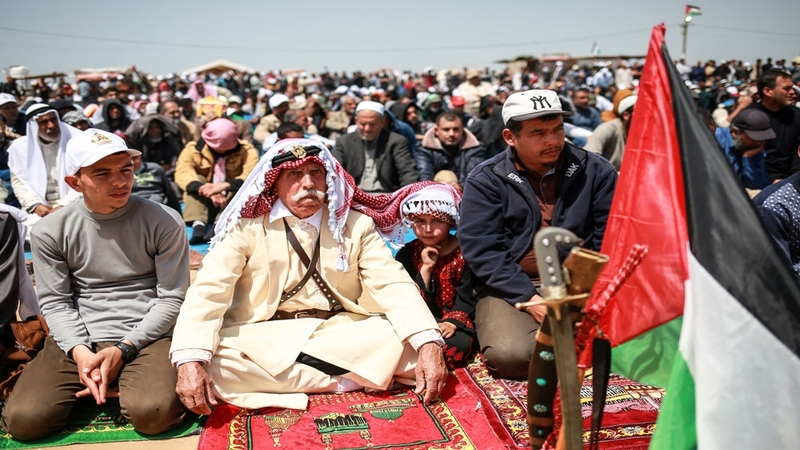 “People are very enthusiastic to come and take part in the protests because they know without participating in this non-violent form of resistance they can’t achieve their objective,” Abu Shariek told Al Jazeera. When asked whether the protests would lead to any tangible concessions by the Israelis, Abu Shariek said: “We are implanting an idea in the minds of people across the world that Palestinians have rights and they hope for the right of return. Reporting from the protest site, Al Jazeera’s Bernard Smith said the thousands of Palestinians in attendance were being subjected to a “barrage of tear gas from Israeli soldiers”. “Thick black smoke has now filled the air as they try to obscure the view for Israeli soldiers,” Smith said. “This is a peaceful protest as it has been over the last few weeks. At least 40 Palestinians have been wounded by Israeli use of live fire and tear gas during protests along the Gaza-Israeli border, reported by the Palestinian Ministry of Health. The Israeli army “is prepared for all scenarios. Stay away from the fence and do not attempt to harm it,” read the leaflets, which were scattered by Israeli aircraft along the border in the early morning. A bullet also grazed the arm of Middle East Eye’s photographer Mohammed al-Hajjar at the same location. 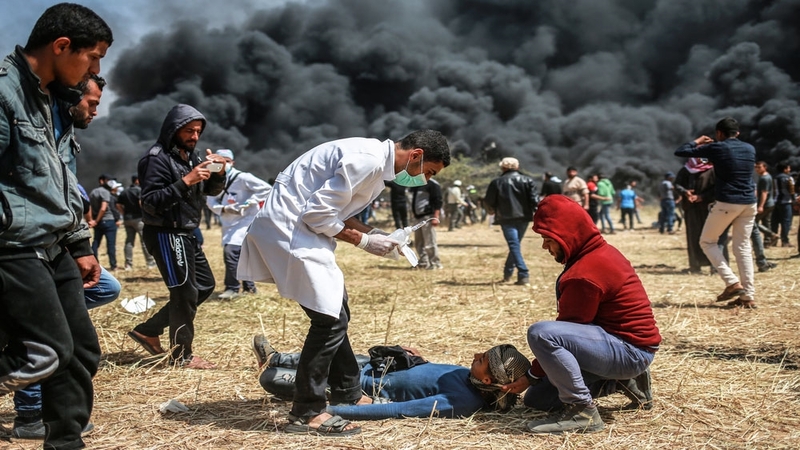 The spokesperson for Gaza’s health ministry Ashraf al-Qidra had condemned Israeli forces targeting a mobile clinic east of Khan Younis with tear gas, resulting in the suffocation of 10 medical staff. “Despite the direct targeting of our medical points, we are determined to continue providing treatment to our people under all circumstances,” he said. Al Jazeera’s Harry Fawcett said that three protesters east of Gaza City have already been wounded by Israeli forces. “What we have seen over the past two Fridays is a great number of people shot by Israeli snipers,” he said, speaking near the encampment near Gaza City. According to Gaza’s Ministry of Health, more than 1,600 Palestinians were wounded last Friday. One them, Izz Abu Shanab, is a freelance photographer and told Al Jazeera he was wearing a flak jacket marked with “PRESS” and a helmet. 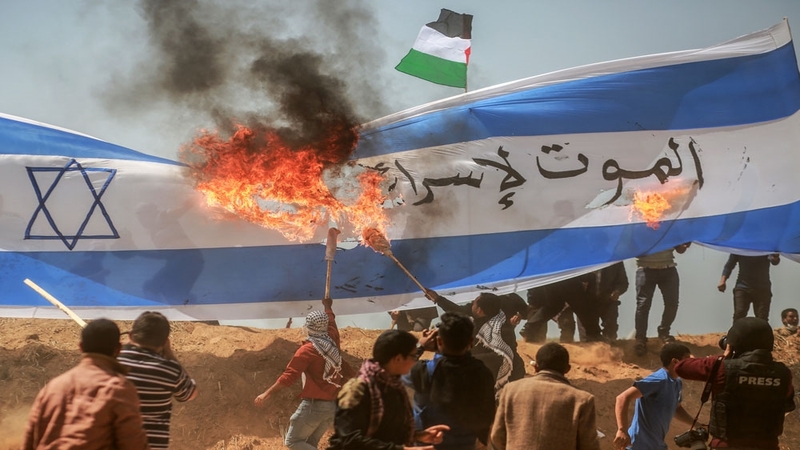 Amer Shreiteh, member of the Coordinating Committee for the Return March, told local Palestinian media that Friday’s protest theme has been dubbed as “Burn the Israeli flag and raise the Palestinian one”. “A 25-metre flag mast has been built for each of the five encampments along the border,” he said. The Palestinian Shehab News Agency is reporting that the death toll in Friday’s protests has risen to nine, after Alaa Yahya al-Zamali, 17, was shot dead by Israeli forces in Rafah. 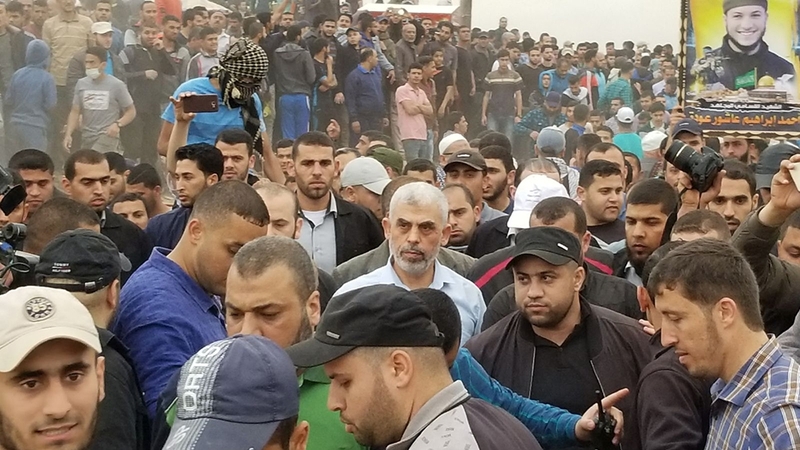 Yahya Sinwar, the leader of Hamas in the Gaza Strip, has made a rare public appearance at a protest near the city of Khan Younis. Freed in a 2011 prisoner swap with Israel after more than 20 years in jail, Sinwar told the crowd that Gaza would “stand tall” in the face of Israeli occupation. “The plot of starvation and siege have failed to incite the Palestinian people against the resistance [Hamas]. “Gaza will not starve and will not abandon its national objective. The teenager, Hussein Madi, was dead on arrival after he was taken to Gaza City’s Shifa Hospital, the ministry added. Hosam Salem, a photographer at the scene in the southern Gaza Strip, told Al Jazeera that there are currently 8 protesters in the intensive care unit at the Nasser Hospital in Khan Younis. Shbat’s death brings the total number of protesters killed on Friday to three, after Thaer Rab’a, who was shot by Israeli forces during the March 30 demonstrations, succumbed to his wounds earlier in the day. Al Jazeera’s Hoda Abdel-Hamid, reporting from Gaza, says Palestinian protesters have remained “defiant” despite Israel saying it will not change its rule of engagement. “Some young boys have been carrying mirrors to blind the soldiers stationed all along the border,” she said. “We’ve seen them with makeshift homemade gas masks which won’t really protect them from anything. According to Ashraf al-Qidra, the health ministry’s spokesperson, five are in critical condition after being shot in the head or in the upper body. Mahjoob Zweiri, a professor at Qatar University, told Al Jazeera that the protests are the outcome of “years and years of frustration” by the residents of the Gaza Strip. “If you look at the past 60 years there has always been delayed action from the Arab League and the international community [with regards to] the Palestinian question,” he said. UN High Commissioner for Human Rights spokeswoman Liz Throssell has expressed concern over further violence during Friday’s demonstrations and in the weeks ahead. Earlier, Gaza’s Ministry of Health confirmed the death of Thaer Rab’a, 30, who succumbed to his injuries after he was shot by Israeli forces last Friday. This brings this week’s death toll to 22 Palestinians. “[At the five encampments along the border] you have entire families with their children dressed in traditional Palestinian clothes,” she said. “They are having picnics, they are sitting on the floor, and there’s a lot of vendors on the side. “The march is organised by refugees, doctors, lawyers, university students, Palestinian intellectuals, academics, civil society organizations and Palestinian families,” Asad Abu Sharekh, the spokesperson of the march, told Al Jazeera. Makeshift tents have been erected 700 metres away from the Israeli fence, symbolising the right of return for Palestinian refugees, who make up 70 percent of the Gaza Strip’s population of two million.